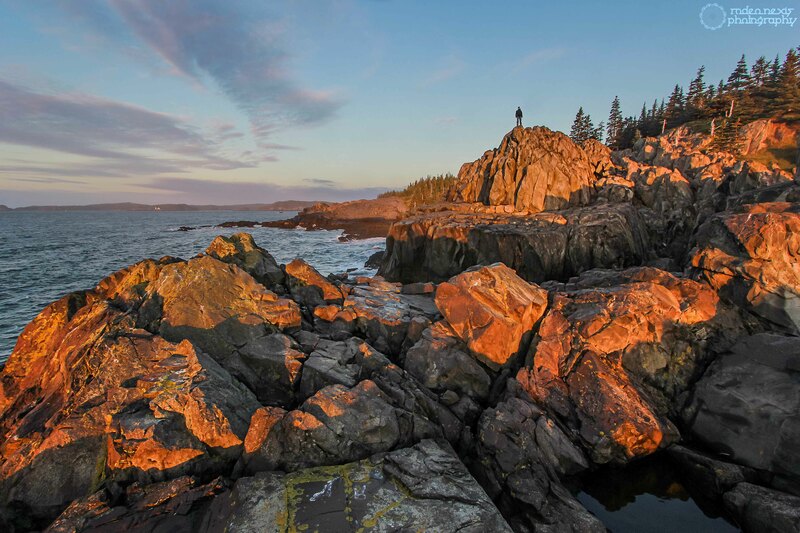 The state of Maine is one of the most alluring and rugged locales on the eastern seaboard of the US, and places like Acadia National Park and Portland Head Light have helped popularize its harsh beauty. But beyond the staple landmarks and postcard pictures, there is a lot of uncharted splendor that even locals are passing up. 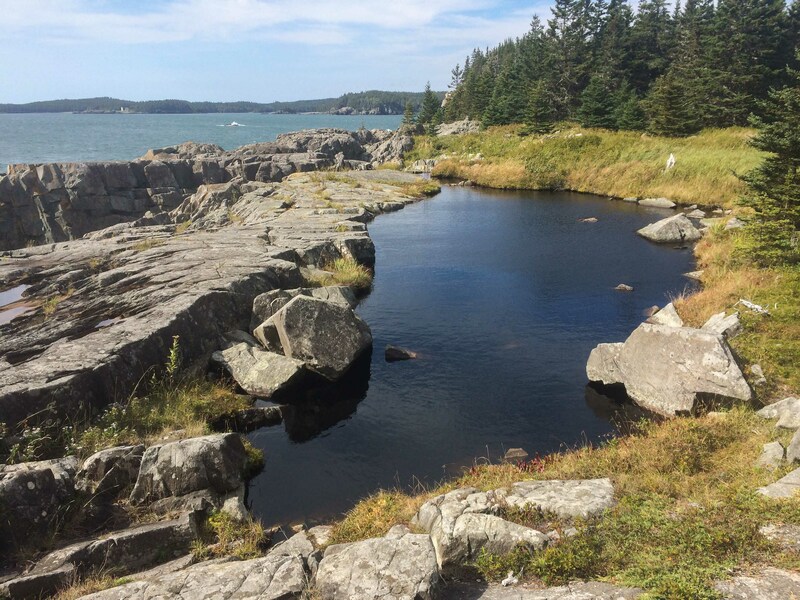 Unlike Mount Desert Island and Baxter State Park, the Bold Coast is largely unknown outside of Down East Maine. Since it lacks any major designation by the state or federal government, it’s little more than a gravel parking lot off ME Route 191. Luckily, the Maine Coast Heritage Trust (MCHT for short) has taken to governing it, along with many other sites up and down the coast. I had been to the first viewpoint next to Holmes Cove in 2013, but this time I was determined to backpack all the way down to Fairy Head and snag a campsite for Saturday night. I awoke before dawn and cinched my 70 liter Osprey bag tight. The jagged cliffs and churning ocean reminded me of the shattered coastal landscape found in the Pacific Northwest, and I quickened my pace. My hope was to catch the sunrise at a specific spot along the initial Coastal Trail, but I soon realized I was far behind schedule. Instead of killing myself at a breakneck speed, I dropped the 40 lbs bag and pulled out my camera. 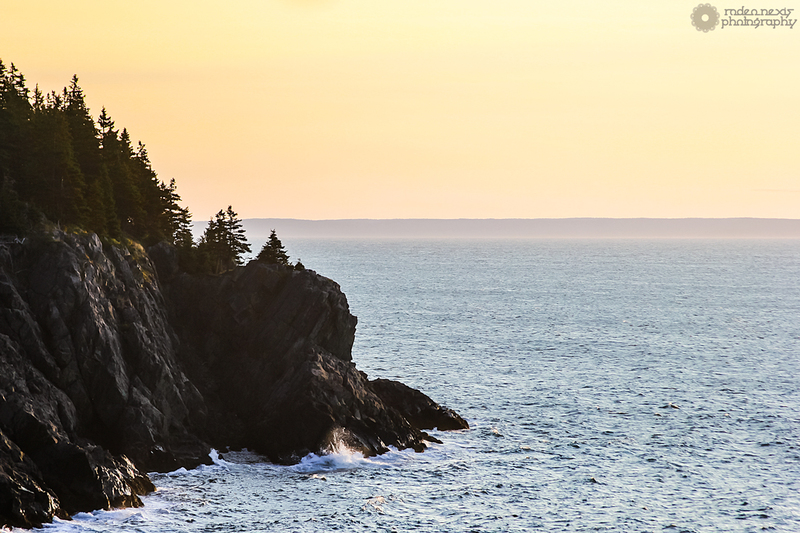 The first 3 quarters of the Coastal Trail hang on the edge of massive granite cliffs overlooking the Bay of Fundy. Numerous side trails lead to dizzying drops and crashing waves below. I’ve backpacked all over CO and UT, but was surprised at the difficulty of carrying a load on this trail. With countless ravines and knobs, I immediately gained a new respect for the broken landscape. 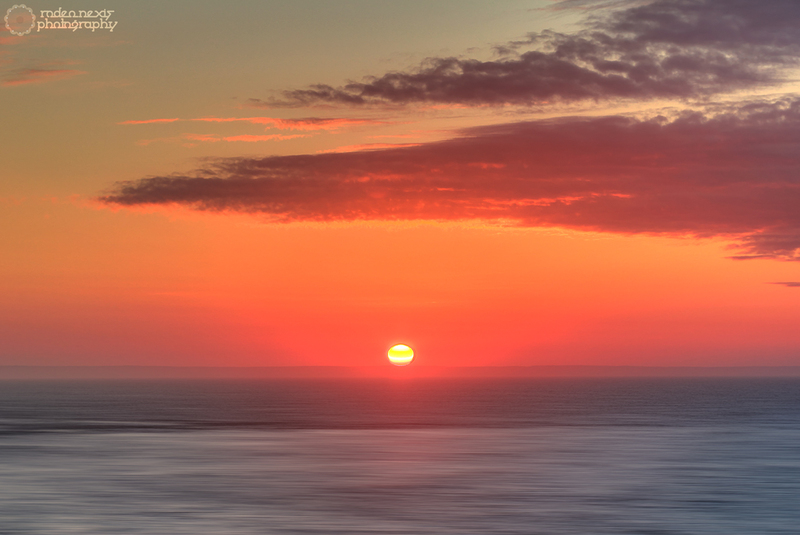 An orange sunrise over the Bay of Fundy and Canada’s Grand Manan Island. As my dog roamed freely through the close knit pine trees, I set an even pace toward the viewpoint I had hoped to find with the rising sun. My calculations put it at 2.2 mi from the parking lot. 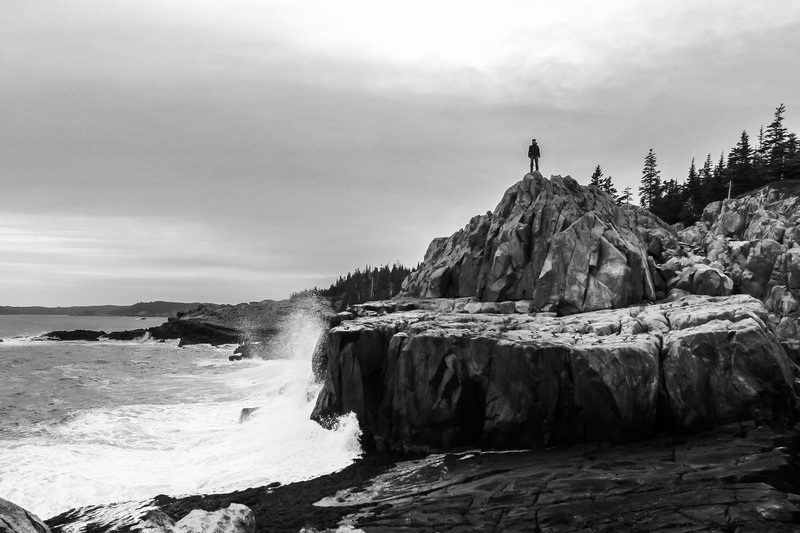 It seems to be the most popular image when searching Google for the “bold coast.” I spent extra time exploring this segment of the Coastal Trail due to its photogenic nature, and accessibility to the rocky beaches below. By following the trail a few minutes past the viewpoint seen below, one can find the gentle slope of a seasonal stream that leads down to the waters edge. 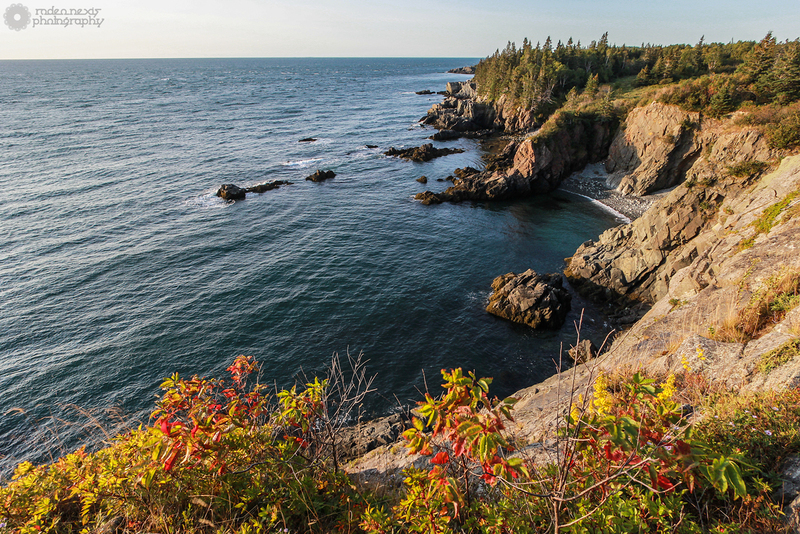 Even though it’s serrated, the cove is protected from the waves and made for a great place to scramble and rock climb. By this point I was ready to find Black Point Cove which roughly marked the halfway point to the day’s backpacking. The trail was ducking into the woods more and more, and I was ready to shed the heavy pack and explore the coast more freely. Here’s an image of the rocky beach with my iPhone 5s. The waves had pushed up a “dune” of rocks, but the currently dormant brook had cut a swath through it over the years. Stopping to examine the polished stones was tempting, but I kept a move-on instead. The rocky beach at Black Point Cove. This is where the inland trail breaks for higher ground. Just after the wooden stairs pictured above, I found the first semi “official” campsite which is NOT labeled on any maps, but has its own sign. It’s small and close to the trail, but no other sites are nearby. This would be a decent place to stay during a windy outing, or if skipping most of the coastal trail and coming from the inland route. 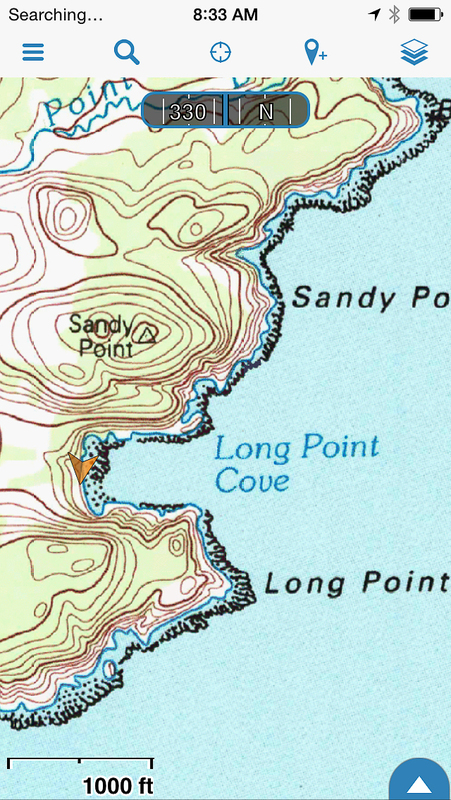 Detail of Long Cove, and an arrow at the potential campsite. Thanks GiaGPS. From Black Point, the trail became less traveled, but the going got easier. It cut deeper into a beautiful birch forest and the autumn colors were just starting to show. Not much changed until I reached Long Point Cove. This time, I passed another campsite just before the stairs down to the rocky beach. The day was very windy, but inside the cove I barely felt a whisper. Due to its protected nature, this is the spot I would have chosen on a windy day. It’s also large enough for a big group. I was sick of carrying my bag, and decided to quit dilly-dallying around. I hightailed it toward Fairy Head with the whole day ahead of me. Trail below Campsite #1. 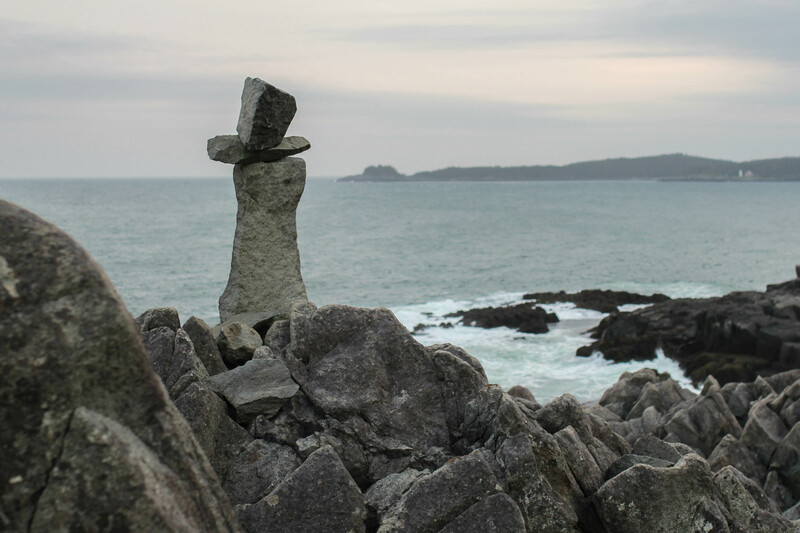 Fairy Head, Cutler Coast. 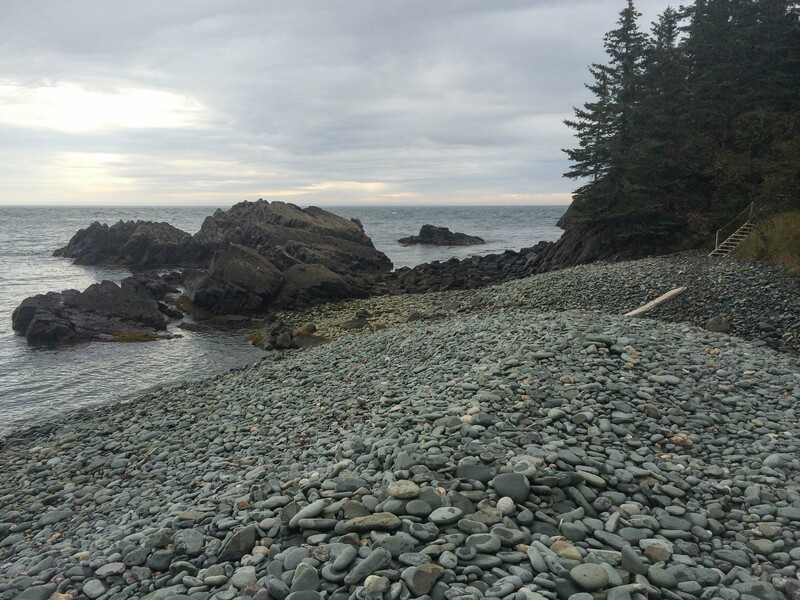 SITE #1: It had a great elevated position above the broken rocks below, and looked SSE out toward Grand Manan Island and the Bay of Fundy. 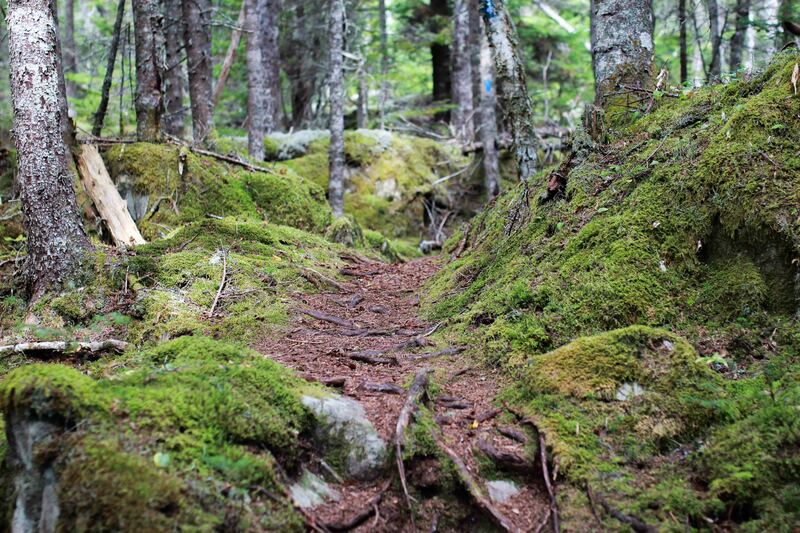 Little trails cut into the thick trees, and moss grew on everything! There was a sketchy but usable “toilet,” and a few sparse trees protected the site from the mounting breeze. 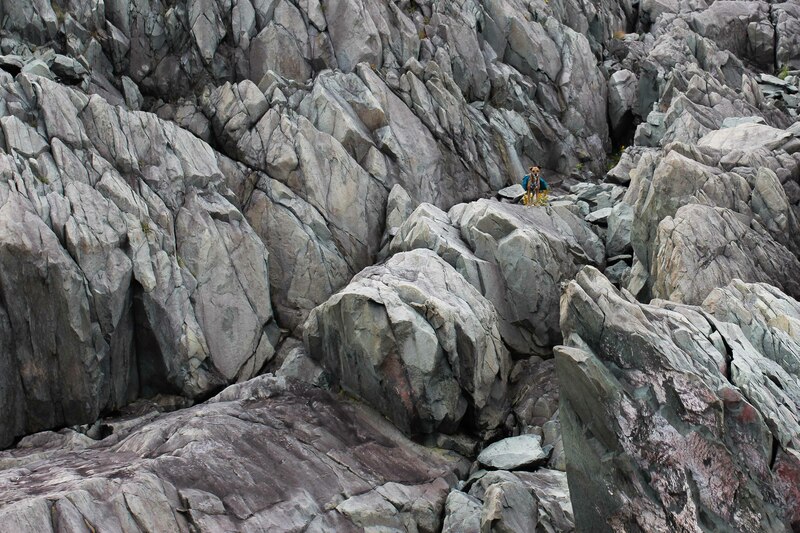 SITE #2: This spot is the highest of the 3 official sites, and sat on a ridge 150 feet above the crashing waves below. It consisted of 3 separate (but close) areas. The primary site was pretty windy, but had some tree protection. the next spot was 50 feet away and had the best view complete with a fire pit, but the wind whipped through like a freight train. Lastly, another 50 feet brought me to a sheltered fire pit down behind the ridge. SITE #3: The last and most secluded site of the official camp spots, site 3 faced back toward the Little River Lighthouse, and ultimately Cutler. It was the lowest of the 3, but was closest to a nice freshwater reserve. The water looked clear, and the surrounding granite made for good access. After surveying my options, I immediately chose campsite 2 and hunkered down at it’s smallest but most protected fire pit. As the day passed, I roamed up and down the shore, and even ventured inland to see what it might offer. A great wall of granite below Campsite #2. Karma lends a sense of scale. 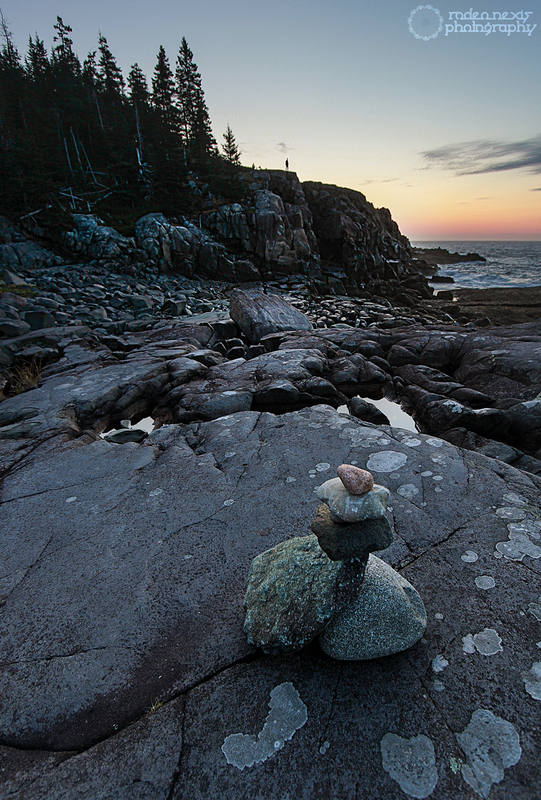 Fairy Head Cairn, looking SSW toward Western Head, Cutler, ME. 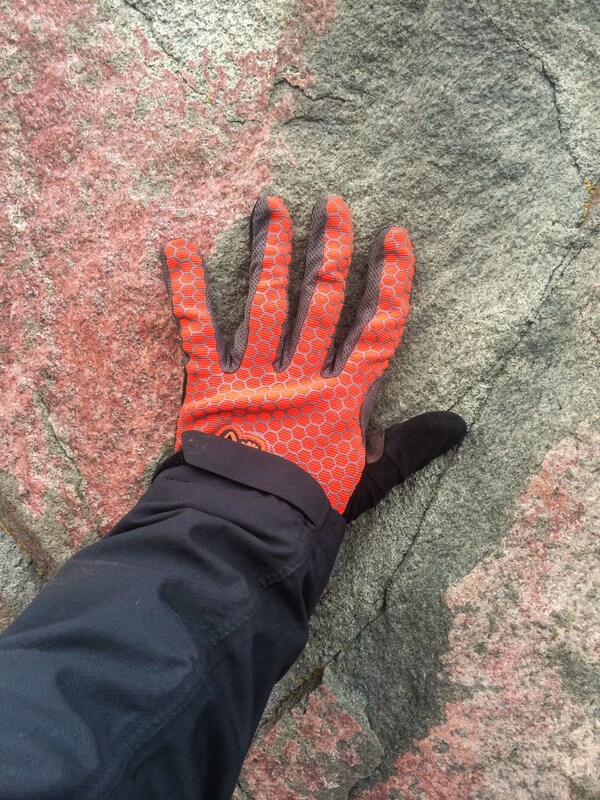 Some beautiful colors can be found in the granite boulders that line the Fairy Head coast. All of the official campsites have clear signs that state NO FIRES PERMITTED. During warm summer months this would be an easy directive to follow, but being alone in the dark with little more than my thoughts and camera didn’t sound enticing. With copious dead branches lying around, I focused my energy on collecting firewood and preparing for the bone chilling night time wind. 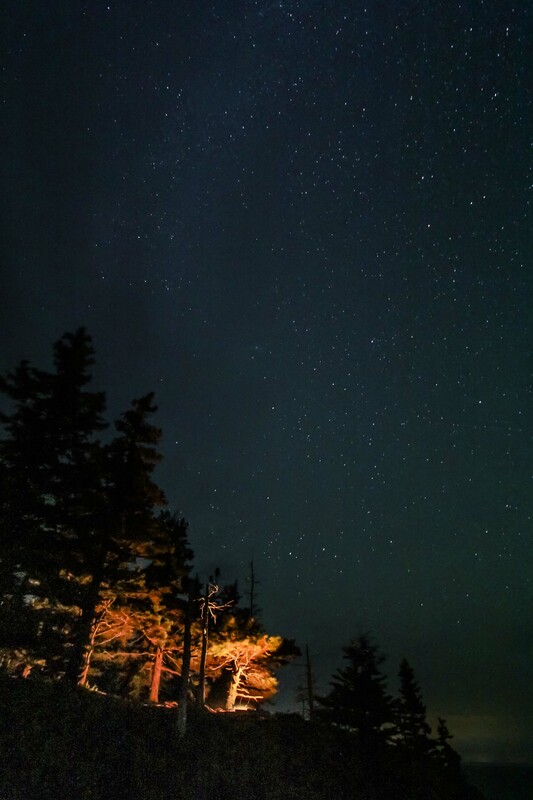 High up on the ridge, looking out toward the Atlantic and deep into the cosmos. One more token pose on the cliffs next to campsite #2 before pushing off toward the car. After the light became less ideal for photos, I begrudgingly packed my backpack and set off toward the car. 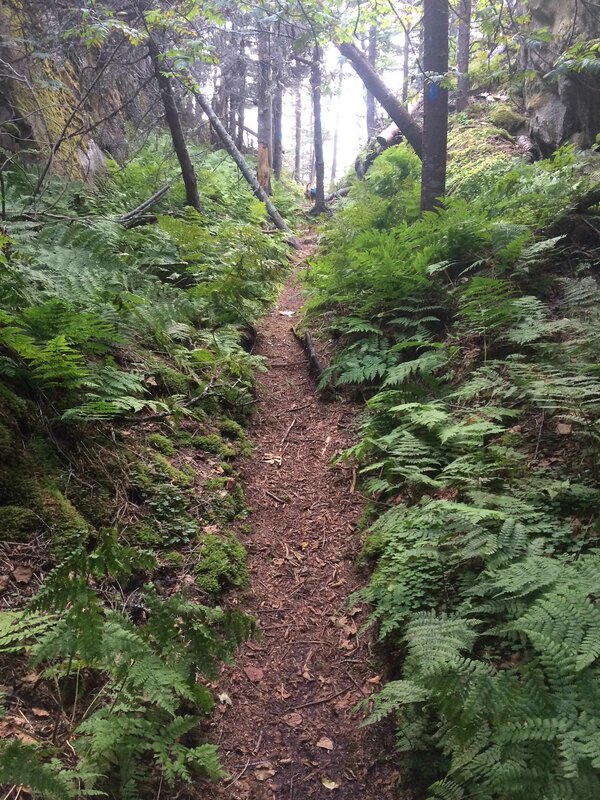 I opted for the Inland Trail from Black Point Cove, and took the gradual incline in stride. I felt a bit guilty for not completing the whole figure eight, but by this point I was over viewpoints, and ready to get back to my car. Once on the road back toward Portland, I realized how close the Bold Coast really is from the rest of the world. It’s just enough to say you’ve roughed it, but easily doable in a weekend or 36 hours. Exploring Down East is an amazing experience, but ALWAYS remember to pack out what you pack in, and leave the place cleaner than you found it. With that said, thank you for taking a second to read this trip report. I hope it has sparked your adventurous side, and you will find your way there soon. Until next time…cheers!